During his drawing phase, Jiang Wei can show any number of the cards he drew. Then he asks one other player to give him a card with a different suit. If they do not, Jiang Wei can either recover one blood or damage the other player one. 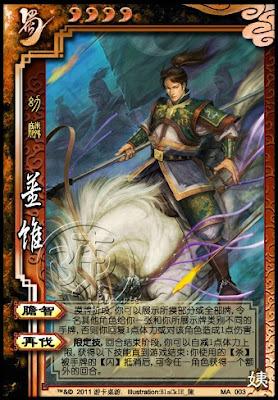 Either way, Jiang Wei discards the cards shown. Once per game, at the end of his turn, Jiang Wei can reduce his maximum health by one. He the acquires this ability for the rest of the game. When another player escapes Jiang Wei's attacks with a hand card, Jiang Wei can compete with the target. If he wins, Jiang Wei can choose any player. This player gets another turn after their normal one. Jiang Wei must show at least one card for "Instinct". Jiang Wei decides if he wants to recover blood, or damage the other player. The damage received by the other player is from Jiang Wei. Jiang Wei only reduces his maximum health once in "Second Cut". The benefits last for the rest of the game though. Jiang Wei can only allow a player one extra turn at a time. The player cannot store up multiple turns all at once. Jiang Wei can choose to give himself an extra turn. He can only do this option once, during his first turn. He cannot keep allowing himself to repeat turns. If a player escapes his attack with the Eight Trigrams or other armor, Jiang Wei does not get to activate "Second Cut". There is no penalty for losing while competing during "Second Cut" for Jiang Wei.